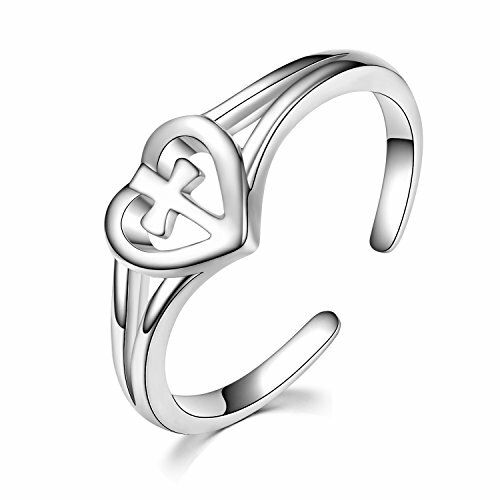 STERLING SILVER LOVE CROSS RINGS WILL BE A GOOD CHOICE AS A GIFT IN ALL DEPARTMENT OR KINDS FESTIVALS. LUHE Jewelry made for simple and classic. "Advocate to simple life". 1.To maintain silver dry, do not wear swimming, not close to the hot springs and sea water, cosmetics, etc., when not best to use a good bag sealed to prevent the silver surface in contact with air oxidized black. ♥MATERIAL: 925 sterling silver,tarnish resistant,hypoallergenic,nickel-free,lead-free,cadmium-free and does not contain any allergic element. ♥BEST GIFT CHOICE: comes with a gift box,this sterling silver love cross ring will be a perfect gift for birthday,graduation,anniversary thanksgiving christmas mother's day and valentines day,beautiful gift for mother,grandmother,daughter,wife,girlfriend,sister,aunt,mom,mum,mother-in-law,grandma,nana,granny,friends and yourself. ♥100% satisfaction + free return: we provide 30 days money back guarantee（replacement or full refund) for any reason.if you're not completely satisfied, please feel free to contact us first. If you have any questions about this product by LUHE, contact us by completing and submitting the form below. If you are looking for a specif part number, please include it with your message.